Sunday, August 18, 2019 – 3 to 4:30 p.m.
Ichiro Irie is a multidisciplinary artist, as well as curator, gallery owner and professor at Oxnard College. Born in Japan and reared in Westside LA, he originally studied film and communications at UCSB, earned an M.F.A. at Claremont Graduate University and was the recipient of a Fulbright Fellowship where he studied in Mexico City. 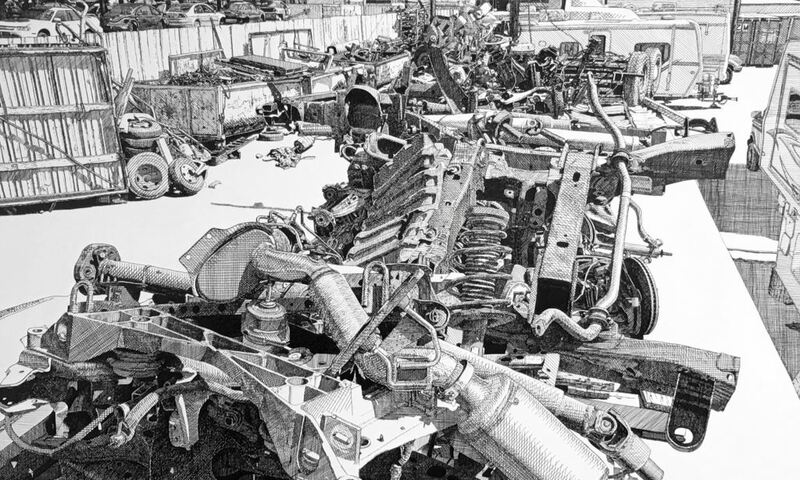 His meticulously detailed ink drawings explore themes of destruction and ruin of junkyards, crashed cars and other reflections of contemporary destruction. Join us for AfterGLOW, a celebratory supper at the home of Thomas & Laura Cook immediately following the program. Paid reservations are essential & required prior to August 13. We expect this AfterGLOW to sell out.